Distinctively unique and different ... And unbelievably crisp. The Peanut Shop Homestyle Virginia Peanut has become the standard by which all fine peanuts are judged. Plump meaty peanuts are cooked in golden peanut oil with no additives and no preservatives to alter the natural goodness of these jumbos. Try a tin for yourself and give several as gifts to those you wish to receive the finest. 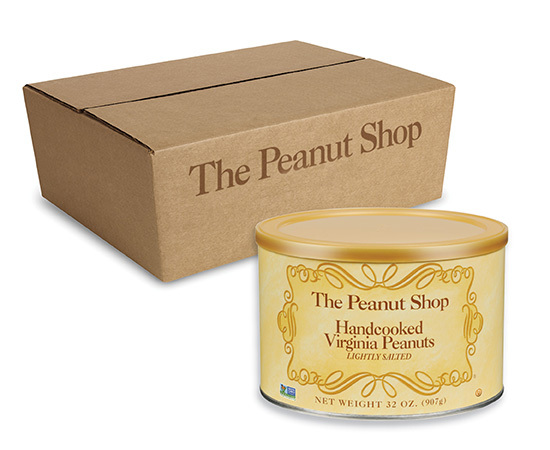 As a transplanted Virginian living in New Hampshire, opening a can of these peanuts is like coming home. My husband, a staunch New Englander, has also "seen the peanut light" and is working to spread the word to his friends up here. I am a competition Trap shooter and I use your peanuts to provide that protein source before events. I have tried other "premium" nuts. They don't come close. The best peanuts I ever had! You have an excellent product, the Hand Cooked lightly salted is my favorite. I refuse to purchase what Planters calls peanuts. Its gratifying to find a consistently great quality peanut, thanks!